Gas cylinders are not permitted to be within 1m from any door, window or airbrick if measured horizontilly. This is measured from the outside edge of the closest cylinder. The distance can be reduced by building a diversion wall large enough to increase the distance around it to 1m. 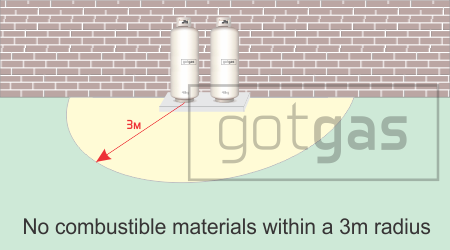 If below a window (and no non-combustable roof is above the cylinder) then the acceptable distance is 3m. This is measured from the top of the heighest between either the cylinders or the regulator. 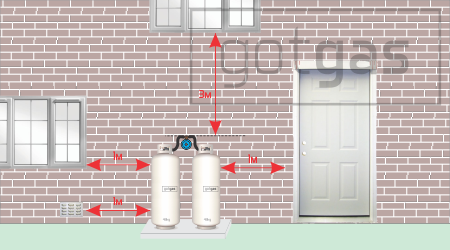 Cylinder distances below windows is normally 3m when no non-combustible roof is installed above the cylinders. 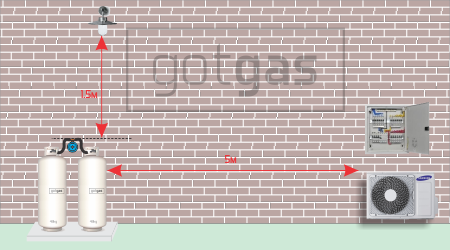 When a non-combustible roof is installed, then the distance may be reduced to 1.5m, provided the distance measured around the roof to the window is a minimum of 1.5m in any direction, as shown in the image, A+B must be greater than 1.5m. 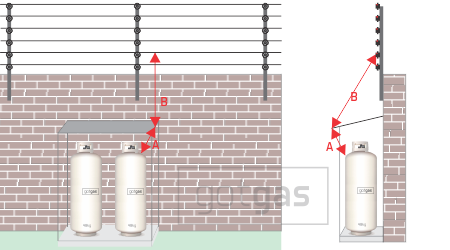 In this scinario it is assumed that the electric fence is higher than the cylinders or regulator, if at the same height, the electric fence needs to be 5m away. Measure from the cylinder or regulator (whichever is closest) to the nearest LIVE wire (this excludes the earth wire). 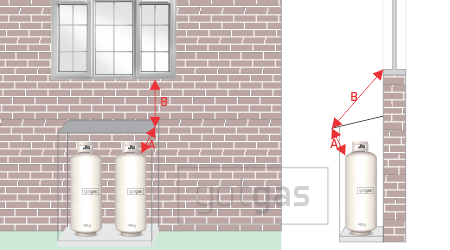 If there is no non-combustible roof above the cylinders, then measure in a straight line as to achieve the shortest distance. If a non-combustible roof is installed, then measure around the roof as shown in the drawing. It should not measure less than 1.5m. In the case of the diagram, then the measuremetns for A+B shoudl not exceed 1.5m. The area directly adjacent to the gas cylinders should be kept clear of non combustible materials. the required radius is 3m. This includes, wheelie bins, wood, dried leaves or compost, garbage, other fuels and anything that can burn. Cylinder distances from electrical items are very important and should be adhered to strictly. This is one of the most common non-compliance issues we see when asked to inspect a site. Distance from any electrical source of ignition is 5m if the same or lower height as the bottles. If the electrical source of ignition is higher than the regulator or bottles, then the distance can be reduced to 1.5m. Some common electrical ignition sources include: aircon compressors, pool pumps, meter boxes, generators, lights, switches, plugs. This is another common non-compliance area. All too often we find the isolator for the oven directly above the stove/hob, or very close to it. The minimum distance required here is 200mm from any plug or isolator. If you were to imagine a line running directly towards the wall from the edge of the stove or oven (NOT THE BURNER), then run that line direclty up. The distance from that line to the edge of the plug or isolator needs to be min 200mm. See image. 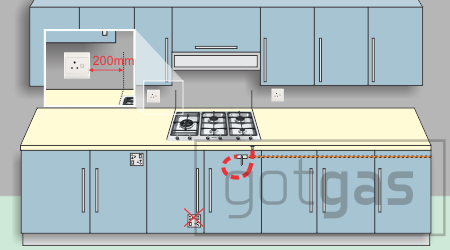 In the case of a hob, where the gas connection will be in the cupboard below, that cupboard cannot contain any plugs, and the flexible orange hose may not pass through any cupboard dividers. Meaning the pipe into the cupboard needs to be of a more permanant nature, either, copper, pex, CSST or steel.